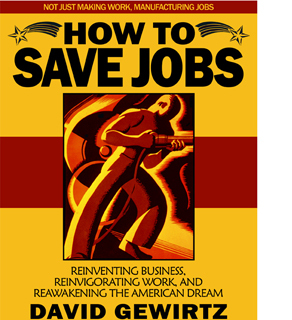 Editor's Note: This article continues our 8-part series excerpted from the "Healthcare Hostage Crisis" chapter of AC360° contributor David Gewirtz's upcoming book, How To Save Jobs, which will be available in October. To learn more about the book, follow David on Twitter at http://www.twitter.com/DavidGewirtz. Last week we debunked the prevailing belief that most employers provide healthcare benefits. This week, we look at how much it all costs. According to the Kaiser/HRET HRET Survey of Employer-Sponsored Health Benefits, it costs about $2 per worker hour to provide health care coverage to an individual. This fact alone is why America is going to have considerable difficulty competing against lower-wage countries like China and India - and why many American firms can't resist outsourcing jobs to those countries. Author note: In an earlier chapter of the book, I describe how much money workers in China and India make as compared to Americans. In China, $2 a day is considered middle class. Although these countries are growing at an epic pace, they have shocking poverty levels. More people in China and India are starving than the U.S. has people. More than 162 million people in China and more than 242 million in India are at a starvation level. When I describe these folks as hungry for jobs, I mean that literally. That said, even though everyone deserves a good life, America must still compete in a global market, and the following paragraphs describe what we're competing against. In China, if you recall, anyone making more than $2 a day is considered middle class. Here, in America, it's costs $2 an hour just for the health insurance component of a typical American's wages. It costs the typical American employer eight times more each day to pay for an individual employee's health insurance (and that's before wages) than it costs to employ a "middle class" Chinese worker, wages and everything. Put another way, just the health insurance load for a typical American employee is eight times the cost of the total wages for a Chinese employee. According to the Kaiser study, average health insurance premiums went up 119 percent between 1999 and 2008. In 1999, a year of family health insurance provided by an employer cost an average of $5,791, of which the employer paid $4,247 and the employee paid $1,543. But, by 2008, the average cost of employer-provided family health insurance was $12,680 per year, of which the employer paid $9,325 and the employee paid $3,354. Few larger employers distinguish between providing individual insurance or family insurance. An individual's insurance for a year costs $4,704 while the family insurance costs an employer $12,680. Of course, these numbers are averages. Health care spending, per capita, varies widely based on where you are in the country. According to the Congressional Budget Office, average per capita health care spending in 2004 was "roughly" $4,000, but in Massachusetts, it was $6,700. Interestingly, there are more doctors in Massachusetts, with about 450 physicians per 100,000 residents. In Utah there are about 225 physicians per 100,000 residents. Are the doctors going where the money is, or is more money being spent because that's where more medical care is available? Going back to our comparison with Chinese workers, just the health insurance cost shouldered by an American employer for a typical American employee with a family (before payroll) is 24 times the cost of the total wages for a typical Chinese employee. With health care costs in our country rapidly approaching $2.4 trillion annually - nearly $8,000 a year for every man, woman and child in America - the U.S. spends more on health care than any other nation. Here, in America, we spend more than three times more on health (insurance and care) each year than we do on the national defense. Our total annual expense as a nation for housing and food - combined - is only slightly more what we spend for just health-related expenses. In fact, we spend more on health here in the U.S. than the entire GDP of the United Kingdom, France, and Canada - and just below the entire GDP of Germany. Our health care cost is bigger than England's entire economy! Interestingly, in a country where we're arguing the issue of a national health care system, the U.S. spends more than twice (as a percentage of gross domestic product) than either the U.K. or Canada, who have national health programs. The U.S. spends 16.6 percent of its GDP on health care, while Germany, France, and Switzerland spend 10.1 percent to 13.0 percent - and India and China spend less than 5 percent. According to the Centers for Medicare and Medicaid Services, America's national health expenditure (how much, overall, we spend for health) increased by $500 billion in just the last four years. They predict that within five years, by 2015, it will go up by another $2.4 trillion. Averaged across every American, the Centers for Medicare and Medicaid Services estimated that each of us will have to spend $11,684 per year on health care and health care-related expenses by 2015. Health care costs for a family will be far north of $25,000 per year - out of reach of many American families. The big spender, when it comes to health care, is actually the U.S. government. Forty-six percent of the national health expenditure comes from Medicare, Medicaid, and other public sources. Another 35 percent comes from private insurance and employer-provided insurance - and 12 percent is out-of-pocket. Hospitals and other health care providers are gaming the system, and it's costing employers. Hospitals account for about 33 percent of all health spending for private insurance and 37 percent of all spending for public insurance. Interestingly, for those who have to pay for their own care out-of-pocket, hospitals account for only 8 percent of the yearly health care cost. A lot of people aren't getting the hospital care they need, because they just can't afford it. Here's how it's gamed, according to data from the American Hospital Association (AHA). The AHA claims that Medicare and Medicaid pay 88 to 91 percent of a given hospital's cost to provide care. So, apparently, hospitals make it up on the private payers (this according to the potentially biased presentation of the Blue Cross Blue Shield Association). According to data "adapted" from the AHA by Blue Cross Blue Shield, hospitals bill 132 percent of their costs to private payers. Obviously, it's in the private insurance companies' interests to make the case that they're picking up the slack for government programs. But it is interesting that hospitals appear to be making a 32 percent profit on health care provided to patients who have private insurance. On the surface, this wouldn't be a big issue. After all, we accept on faith that companies should be allowed to profit from their work. But there is an exception. Nonprofit companies are, by definition, not supposed to profit from their work - it's why they don't have to pay the income taxes the rest of us have to pay and even accept non-taxed donations. If you'll recall from an earlier chapter, nonprofits like hospitals are also permitted to bring in an unlimited number of foreign H-1B visa employees, potentially displacing American workers in their own country. If hospitals truly do account for 33 to 37 percent of the overall health care cost in America, that means that hospitals - alone - cost Americans more than the entire national defense. And most don't even have to pay taxes. But are we getting better care? Stay tuned and I'll answer that next. On the Health Care Debate. Clasic America! The American Indian are given a government-run health care system but it's not good enough for everyone else? It's revealing that despite America's power it doesn't have the power to be humbled. It's ironic that those that called us savages are "savaged" by their own sense of "civilized debates" and with guns, physical altercations and threats? The true colonialists are finally showing their true colors and their using fredom of speech, freedom to bear arms, freedom to convene and freedom to religion to mask thier disdain. Just give back my country. "A lot of people aren’t getting the hospital care they need, because they just can’t afford it." Hockey puck!!! I've worked in the healthcare industry for over 30 years. You can walk into any Saint John hospital in this country with or without money and get excellent healthcare! Your care is NOT based on wheather you have health insurance or money. 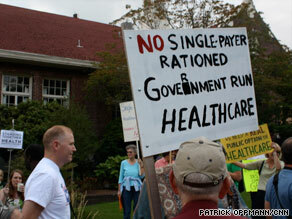 Oh, by the way, cost shifting to private insurance holders or private payers is against the law. So we already spend more than those countries with full health care, and we are being asked to spend even more. The statistics clearly show thet we need to fix the care we have now first before expanding covergae to one more person. Excellent article with nothing for me to add,except? Are we on the same (inflation/deflation;bang for your buck as the other guy?) plane of equilibrium regarding cost-of-living wages China/India,versus cost-of-living wage expenses America? Forget about Europe,and comparing their GDP to the United States,because, if you look at the groups geographically, and super-impose the landmass it's basically a no-brainer. Population.vs. Expense Health-Care Outlays matches the United States via. population,and accumulated proportion of all GDP's! How in the world do we calculate equitable fairness to the American taxpayer regarding a equal-playing field that the American worker has been handed, when a take home pay of $1000/week (two parents contributing & avg.two children family) to compete with a Middle-Class Chinese&Indian Family having a $100/week max.take home pay? How? It's time to get rid of the "Free Trade"globalization rules,that don't work for the American worker, (union, or non-union) but certainly work miracles for the overwhelmingly Chinese & Indian's population. We just don't need this ridiculous Health Care Reform now with the small amount of saving we get,eventually used for financing the "New Afghanistan (Viet-Nam) War",and believe me it's gonna go( something they also call off-budget) there! I've been unemployed for 2 years & never had health care insurance. What am I supposed to pay for it with? My good looks or yours????????? I can never get this one question answered. Who does the working taxpayer owe free health care? I can go along with people layed off from their jobs and receiving benefits, seniors, disabled vets etc. Anyone else is just playing the system and getting free benefits from working peoploe. Am I wrong about this?